Above: Steve Schuh, foreground, after his swearing in as Anne Arundel County executive by Clerk of the Court Robert Duckworth. 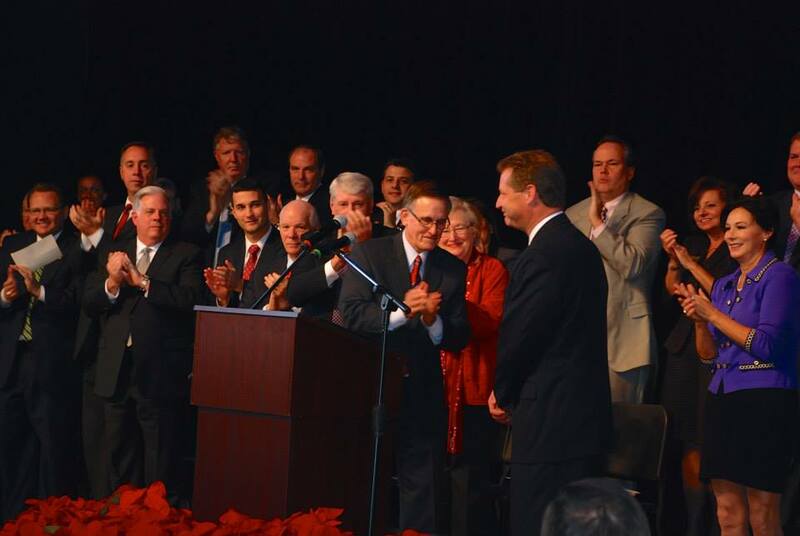 Republican Gov.-elect Larry Hogan Jr. spoke at the swearing in of Sen. Barry Glassman and the all-Republican County Council in Harford County, then he rushed to Annapolis to speak at the oath-taking for Del. Steve Schuh in his home county, where Hogan got a long standing ovation with whistles and cheers. In Howard County, Sen. Allan Kittleman took his oath along with a County Council where only one of the five members is a Republican like himself, and two of the incumbent Democrats had run unopposed for reelection. At Schuh’s ceremony, there were promises of bipartisan cooperation from Democratic U.S. Sen. Ben Cardin and the Democratic Speaker of the Maryland House of Delegates, Mike Busch, who represents the Annapolis area and also happens to work for county government. The partisan contrast between Anne Arundel and Howard counties was particularly evident when returning Howard County Council member Jen Terrasa led off a short speech at the Glenelg High School ceremony with a long quote from Massachusetts Sen. Elizabeth Warren, a favorite of progressive Democrats. In Annapolis, former Republican Gov. Bob Ehrlich, speaking together with his wife Kendel, praised Schuh’s experience as a business owner of restaurants, a golf course and a health club. “You could say he built that,” Ehrlich said, a swipe at an earlier quote from President Obama that business owners didn’t build their companies on their own. With the results of the Nov. 4 election, Anne Arundel County has become the most dominant Republican county in Maryland. The GOP sweep was wide and deep, top to bottom. Hogan, an Edgewater resident with his real estate companies based just outside of Annapolis, carried the county by 61,000 votes, the largest margin in the state. It rivals the 65,000 vote margin statewide by which Hogan beat Lt. Gov. Anthony Brown. Hogan did get more votes in the much larger Baltimore County. But his 66% margin in Anne Arundel was impressive considering that county still has more registered Democrats than Republicans. In the race for county executive, Schuh got 11,000 less votes than Hogan in Anne Arundel, but still soundly trounced Democrat George Johnson with 61% of the vote. Schuh was quick to begin establishing his new administration. He will govern with a continued GOP majority of four of the seven-member County Council. Two Democrats had closer races than expected. In District 1, Democrat Peter Smith, who had served on the council for 18 months, replacing Daryl Jones while he did prison time and sought reinstatement on the council, won his race against Bill Heine by just 288 votes. Democrat Chris Trumbauer, who represents District 6 in the Annapolis area, won by 699 votes against Dean D’Camera, who runs his own insurance firm. Incumbent Republicans John Grasso, Derek Fink and Jerry Walker all were reelected. Grasso, something of a gadfly and a staunch environmentalist who has again promised to return his entire salary to the county, had the toughest contest, getting 52% of the vote in his Pasadena District 3. Fink got 73% of the vote, and Walker had no opponent in the general election at all. This is the second and last term for all three incumbents, since council members are limited to two terms by the Anne Arundel County charter. The campaign to prevent Republican Michael Anthony Peroutka from gaining the seat in the heavily Republican District 5 of Severna Park and Arnold failed by 1,900 votes. Peroutka had been disowned by Schuh and other Republicans for his views favoring secession and a Bible-based interpretation of the Constitution. But Patrick Armstrong, a young retail manager, had neither the time nor the money to counter the heavy spending by Peroutka, a wealthy attorney who loaned himself $195,000 to win the primary and general election. Peroutka was the only member of the council who did not attend Schuh’s inaugural. Howard County has been trending more Democratic in recent elections, but this year’s results confirmed Howard as a predictor for statewide returns. Howard County went for Republican Ellen Sauerbrey in 1994 when she lost to Democrat Parris Glendening by just 6,000 votes statewide, but she lost Howard and the state by a wide margin in a rematch four years later. Ditto for Bob Ehrlich who won Howard and his first term as governor in 2002, but lost the county to O’Malley in 2006 and 2010 when he sought reelection. In Howard County, Hogan and Kittleman got about the same percentage of the vote — 51.5% for Hogan and 51.2% for Kittleman. Hogan got 1,100 more votes, but Hogan’s margin of victory over Brown was much larger — 5,100. Hogan’s campaign themes were more clearly defined than Kittleman’s — or at least more memorable because of Hogan’s persistent repetition. Kittleman had less complaint with the two terms of Howard County Executive Ken Ulman — with whom his opponent Courtney Watson was closely identified — than Hogan had with the eight years of O’Malley. At his swearing in, Kittleman praised both Ulman and Watson, who were in the audience. Harford County Executive Barry Glassman, just a year into his new post, is exploring a run for U.S. Senate, at the urging of campaign advisors, he said. Glassman, a Republican, authorized a poll by his campaign that shows him relatively popular in the Baltimore region and able to beat the other candidates in the Republican primary for U.S. Senate. That includes Del. Kathy Szeliga who represents part of Harford County and formally announced her candidacy Tuesday.